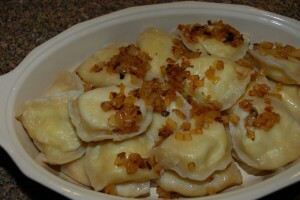 Pierogi (stuffed dumplings) are a quintessential Polish comfort food and can be stuffed with meat, potatoes, cheese, sauerkraut, mushrooms, or fruit as well as many other fillings. Personally I prefer pierogi stuffed with mushrooms, importantly with the addition of dried porcini mushrooms which give a fabulous, evocative earthy aroma of forests and give the pierogi a delicious depth of flavour. These pierogi can be served with golden sautéed onions and sour cream or finely chopped crispy fried bacon and make a delicious snack or main dish. Serves approximately 6.
y floured work surface and knead, adding only as much additional flour as needed to keep dough from sticking, until smooth and elastic. Cover with plastic wrap and let rest at room temperature at least 30 minutes. Cover the dried porcini mushrooms with boiling water and allow to stand until cool. Chop onion and gently fry in a mixture of butter and olive oil until soft. Slice fresh mushrooms and add to the onion with chopped garlic and fry until starting to brown. Allow to cool. Place the mushroom mixture in a food processor, and pulse until finely chopped. Set aside. Transfer to a pan to dry off the mixture, adding parsley, salt and pepper to taste. Roll out some of the dough thinly and cut out circles approximately 21/2 inches in diameter. Wrap the remaining dough in cling film to prevent it drying out. To form dumplings, place a teaspoon of the filling toward the front of a circle of pierogi dough. Moisten the edges of the dough with water, and fold in half around the filling to form a semicircle, firmly pinching the edges closed. Set aside on a lightly floured baking sheet. Bring a large pot of salted water to a boil, and add half the pierogi. Boil gently until they float to the surface, about 2 minutes. Continue cooking for another 3 to 4 minutes. Drain, and repeat with remaining pierogi. Serve immediately with finely chopped crispy fried bacon or golden sautéed onions and sour cream.